An absolutely unique performance-to-size ratio! 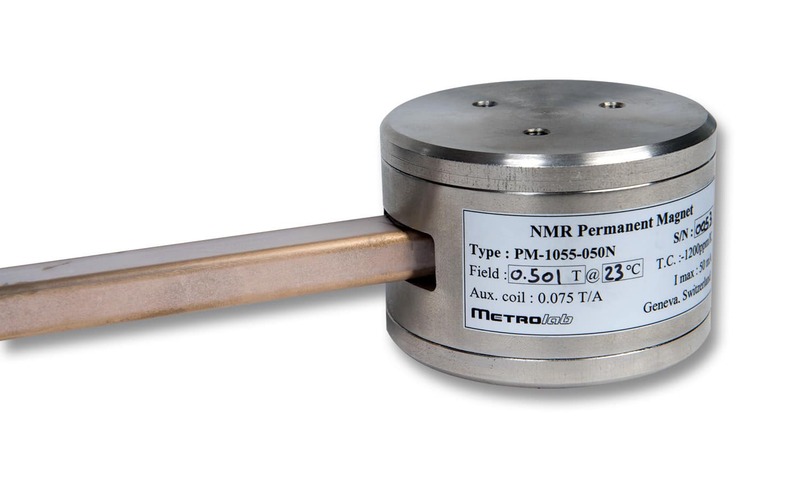 With Metrolab’s PM1055 permanent magnetA magnet using the magnetism "locked into" the structure of a suitable material rather than a current in a coil.... rangeThe range of a probe is defined by the minimum and maximum field strength it can measure. On an instrument,..., scientists now have access to an ultra-compact solution for calibrating Hall probes with a high level of precisionPrecision is how closely multiple measurements will be clustered. Also called reproducibility or repeatability. In everyday speech, often confused with.... With a side opening wide enough to insert an NMRNuclear Magnetic Resonance. A resonance phenomenon seen when you irradiate a sample in a magnetic field with an RF field.... probeThe actual sensor that is placed in the magnetic field. The NMR probe contains the NMR sample; the Hall probe..., each PM1055 can even be turned into a real secondary field reference… that fits into the palm of your hand! Question: what is the main drawback with using Hall probes? If you have one, you should find the answer straight away: calibrationDuring calibration, the instrument reading is compared to one or more references to verify its accuracy. The references themselves need.... Although they are quick and easy to use, and fairly precise (up to 100 ppmParts per million, or 10-6. Bigger than a ppb, but still pretty darn small....), Hall teslameters must be scrupulously calibrated in order to correct factors such as offset, non-linearity and temperature sensitivity. Because these parameters vary over time, in practice this means recalibrating the probeThe actual sensor that is placed in the magnetic field. The NMR probe contains the NMR sample; the Hall probe... before each set of measurements… And because the laboratories where you conduct your experiments are not always next to the national Weights and Measures office, you use a conventional reference magnetA magnet used for calibrating a magnetometer. Reference magnets are often controlled or even regulated by an NMR teslameter.... which, in addition to being rather heavy, is half the size of your desk! Good news: Metrolab – which modestly produces the world’s only handheld three-axisThe magnetic field is a three-dimensional vector quantity. A single Hall element only measures one component. A three-axis Hall instrument has... Hall teslameterSee magnetometer. – also offers handheld reference magnets! The PM1055 rangeThe range of a probe is defined by the minimum and maximum field strength it can measure. On an instrument,... comprises cylindrical permanent magnets generating a highly uniformSee homogeneous. 0.01 to 0.5 T field in their gapThe area between the two poles of a dipole magnet, where the magnetic field is concentrated. Also used to refer.... Their compactness is unrivalled on the market: 80 mm in diameter, 39 mm high (55 mm for the 0.5 T) and about 1 kg in weight. In spite of these ultra-small dimensions, PM1055 magnets have two wide side openings enabling Hall and NMRNuclear Magnetic Resonance. A resonance phenomenon seen when you irradiate a sample in a magnetic field with an RF field.... probes to be inserted. Another feature of Metrolab’s magnets is their very low fringe fields – thus minimizing interference due to ferrous objects around the magnet: you no longer need to calibrate your Hall probeThe actual sensor that is placed in the magnetic field. The NMR probe contains the NMR sample; the Hall probe... in the middle of the Sahara Desert! Metrolab duly calibrates each PM1055 using an NMRNuclear Magnetic Resonance. A resonance phenomenon seen when you irradiate a sample in a magnetic field with an RF field.... probeThe actual sensor that is placed in the magnetic field. The NMR probe contains the NMR sample; the Hall probe..., and its individual characteristics (exact field in the middle of the polePart of a magnet used to focus the flux in a gap. The pole face is the interior surface of... and at several points of the periphery, measurement temperature) are marked on the label. With a temperature coefficient of 0.2%/°C or less – primarily due to the temperature coefficient of the permanent magnetA magnet using the magnetism "locked into" the structure of a suitable material rather than a current in a coil.... material – PM1055 magnets can be used as-is for calibrationDuring calibration, the instrument reading is compared to one or more references to verify its accuracy. The references themselves need... to 1%. For applications requiring more precise calibrationDuring calibration, the instrument reading is compared to one or more references to verify its accuracy. The references themselves need..., a built-in auxiliary coil can reduce field variations to the order of a few ppmParts per million, or 10-6. Bigger than a ppb, but still pretty darn small..... Combining the permanent magnetA magnet using the magnetism "locked into" the structure of a suitable material rather than a current in a coil.... with one of their NMRNuclear Magnetic Resonance. A resonance phenomenon seen when you irradiate a sample in a magnetic field with an RF field.... teslameterSee magnetometer. systems, Metrolab proposes a complete secondary field reference as used by Weights and Measures… but that fits into the palm of your hand. Please refer to the web page for more detailed information. Note that the conceptual simplicity of the magnet also allows for easy customization, for example custom field strengths. Simply contact us to discuss your requirements.